www.bestskippingrope.co.uk recommends the speed rope as above. 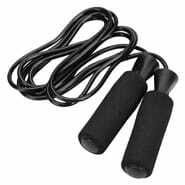 This speed rope features a thin wire ‘rope’ and a 90 degree connection with ball bearings in the handles. This enables the rope to spin easily and effortlessly so that the boxer/athlete can spend more time focusing on technique and footwork. This skipping rope has ball bearings mounted in the handles allowing the rope to spin easier & faster, which in turn helps stop the rope getting kinked or knotted. 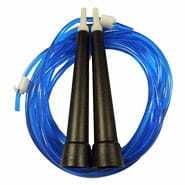 The skipping rope offers just the right amount of resistance therefore helping the athlete/boxer develop his or coordination, rhythm & footwork. The speed rope is not something you would usually find in a shop as it is quite specialist, however you can buy a skipping rope for boxing online. The best place to by these from is gasp fitness who also have an amazon store where you can buy these from. These cost approximately £12.00 and come with a warranty which not many other companies offer. These particular skipping ropes can be found just about anywhere. Tescos or even your local sports shop will probably have these in stock. You can normally pick one of these up for around £5.00. There is nothing wrong with these and they will work perfectly well, though not necessarily the best skipping rope for boxing. Performing all the same footwork, tricks and coordination will require slightly more effort as they will not spin as easy as some of the speed ropes. The disadvantages of these ropes is, overtime if used a high speeds the handles will crack as they don’t have the 90 degree angle that some of the other ropes have, but you should get at least a good few months wear out of this. Perhaps even think of this as a practice rope before you progress onto a faster speed rope. When you think about which is the best skipping rope for boxing you will probably have an image in your head of the skipping rope above. These have a PVC rope, foam handles (sometimes weighted) and a ball bearing which is supposed to help the PVC rope spin more evenly. This only adds to my annoyance when you need to take them apart to adjust the length of the skipping rope. My biggest problem with using a PVC skipping rope is that the more you use it the longer the PVC rope stretches, which is incredibly annoying/frustrating when you are at the gym using one and trying to get into a rhythm. I’m actually not the biggest fan of these. Although the handles are relatively comfortable and the rope is sure to give you a great skipping workout from a personal point of view i find these quite clunky and slow. 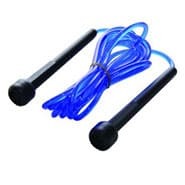 However these skipping ropes are still widely used and often found in boxing gyms.